Nelson De La Nuez, CEO IAHL Corporation and Ishmael Chalabi, CEO of AMCS Corporation sign a Lump Sum Turnkey (LSTK) Equipment Procurement and Construction (EPC) contract for Nataly 1 LNG Plant in El Viajano, Colombia with an estimated revenue from Nataly I to be valued at approximately $1.6B USD over the 15 year term. ORLANDO, Fla., Aug. 17, 2015 (GLOBE NEWSWIRE) — IAHL Corporation (Other OTC:IAHL) is pleased to announce that its subsidiary, Altenesol LLC has finalized the contract with AMCS Corporation for a Lump Sum Turnkey (LSTK) Equipment Procurement and Construction (EPC) for Nataly 1 LNG Plant in El Viajano, Colombia. This is an important milestone which defines the entire construction process identifying key aspects which will trigger the draw down process against construction funding. The contract covers project timetables, insurance liabilities, contingencies and remedies for potential problems as well as penalties and rewards for timely execution. This aligns the project interest and the EPC contractor to build to the highest standards as efficiently and quickly as possible. 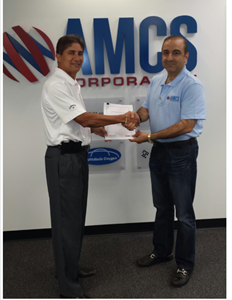 The AMCS team is working closely on all aspects of the project drawing from their experience in the Global market. Identifying areas to expedite and utilizing their history with the various vendors and manufacturers being brought together to complete this project, AMCS continuously uses their core principles as listed below. Has a Proven, demonstrated ability to execute projects anywhere in the world with an installed project base covering 30+ countries. From concept through commissioning, each project is managed by time-lines, budgets, and project priorities. Supporting customers with project focused teams experienced in the planning, design, engineering, and management of projects and facilities. Each project has been executed to maximize plant profitability. “We’ve had a very positive experience working with Altenesol in this project. We believe that the combination of our technology, international project experience and Altenesol’s pioneering vision for the LNG market in this region provides a compelling and powerful solution for the region’s increasing demand for clean energy,” said Ishmael Chalabi, CEO of AMCS Corporation. The incorporation of predicated design changes necessary to accommodate the increase from 180 thousand gallons a day (180K GPD) to 360K GPD delayed the initial AMCS agreement from being executed. Management’s decision to make the expansion now will save the project millions of dollars in the preliminary as well as final stages of the buildout. This is a direct result from Canacol Energy’s (CNE) gas supply contract increase from 17.5 MMSCFD to 35 MMSCFD for a term of 15 years based on the LNG demand. The previously announced contract secures gas supply for the second train doubling total production capacity for Nataly 1 from the initial 180K GPD. When all off take contracts are finalized, total estimated revenue from Nataly I shall be valued at approximately $1.6B USD over the 15 year term. Stages I & II encompasses all necessary equipment for LNG production of 180K GPD and other major required critical components to transition to the 360K GPD. Stage III will finalize all facets to fully integrate the 360K GPD expansion. In short summary the basic technical changes include: a) one single Cold-Box with two Heat-Exchangers cores of 180K GPD capacity each for a 360K GPD LNG production rather that two separate Cold-Boxes as originally planned; b) a second set of Turbo-Expanders as part of the Cold-Box integrated to commence when the second train enters full operation; c) one 2 million gallons field erected tank to store the LNG produced for a 5 days on site reserve at a rate of 360K GPD production; d) a Mercury removal reactor based on the NG chromatography; e) an additional LNG pump to supply a four cryogenic trailers loading station; and f) two 800 kw NG engines generators. The initial gas supply agreement was broadened in scope due to Canacol’s significant gas find, from the Clarinet discovery located on the VIM5 E&P, and the strong vision of the LNG supply and demand market for Colombia, Central America, South America and the Caribbean based primarily on small scale LNG supply with Cryogenic ISO Containers which requires no infrastructure expenses in Colombia and/or any of the off-taker’s port of receipt. “We are pleased to share Altenesol’s vision for small scale LNG production and delivery with the gas from Canacol as this is the cleanest burning fossil fuel supplementing the energy needs for developing countries,” said Charle Gamba, CEO Canacol Energy. Simply put, AMCS will provide an extremely cost effective and highly customized plant solution for Nataly 1. Many significant items inter-related to the completion of the EPC contract can now move forward. The permitting process nears completion as the site preparation readies for ground breaking once final selections have been made regarding equity and debt terms which are in the process. Plans to increase our visibility and our investment tiers will follow as we move from the paper stage to the construction phase of the project. “This journey has not been easy and many obstacles had to be overcome to make this project a success for our company, the investors and the shareholders. We thank you all for the continued support as we move to the final stages of this project and the eventual production of significant revenue,” said Nelson De La Nuez, CEO IAHL Corp.